My old football coach would say "Excuses are like assholes, they all stink and everybody has one." I'm not sure if it's because of my upbringing, or because of the weakness of the concept, but at any rate...they disgust me and should disgust you as well. Robert Kiyosaki says "If you want to be rich don't give yourself the luxury of excuses." I'd like to rephrase and remix. You can make money or excuses, but you can't do both. This is applicable to more than just income. 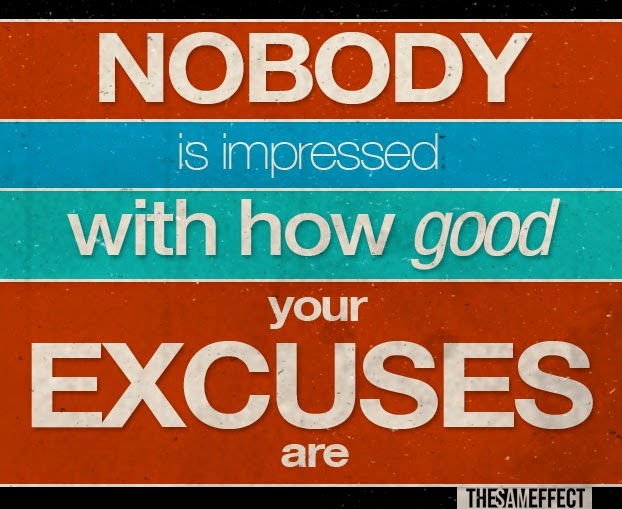 If you want to really accomplish anything in life, don't give yourself the luxury of excuses. In order to succeed, you must stop allowing your excuses and stories to be bigger than your goals and dreams. Stop waiting to build your dreams. They are inside of you, crying to get out! Timing will never truly be right to make your move. If you look hard enough for an excuse, you'll certainly find one. Some may be genuine, but where there's a will there's always a way! If you wait until you have every piece of the puzzle figured out before you act, you'll miss out on your entire journey. Don't get caught in the waiting game and in telling yourself stories about when this or that happens that you'll be ready to make progress. Those are just purposeless self talks that will leave you with nothing but cool could-be stories. You'll regret not taking action sooner. Go get your blessings! No excuses! I'll conclude with this short poem.